This document maps the current situation in the area of ​​intergenerational activities and intergenerational support in European countries. 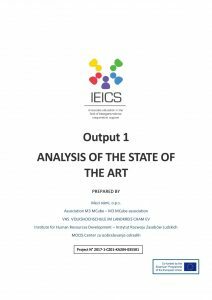 Comprehensive analysis is the first output of the IEICS project, which aims to support intergenerational relationships and activities through a educational program. The analysis was conducted in five European countries – Czech Republic, France, Germany, Poland and Slovenia. The analysis itself consists of a questionnaire about Intergenerational cooperation in specific countries and a deeper analysis of the current state, legislative and other regulations and requirements for the implementation of intergenerational activities. The Analysis with all the outputs from the research is available in English. The main outputs from the research are also available in each national language.